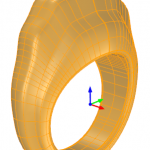 In most cases individual ring jewelry designs are produced in quantity by first creating a 1:1 scale Positive Master Wax Model representing the ring design. 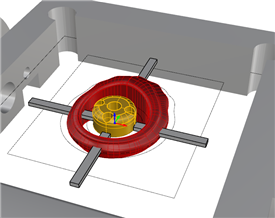 Multiple copies of this positive master wax model is then used to produce the actual ring jewelry in quantities using an investment casting process. 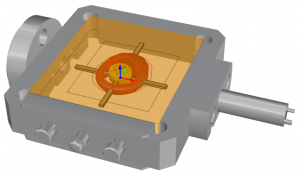 The positive master wax models can be created from cavity molds or by direct machining of the wax material, depending on the quantities required. 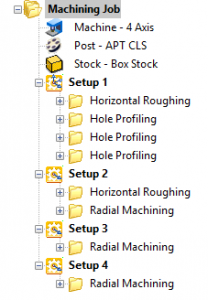 Example toolpath techniques for both processes are detailed below. 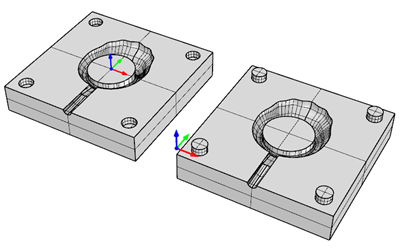 Shown below are the 2½ & 3 Axis toolpath techniques used to machine one side of a single cavity mold. 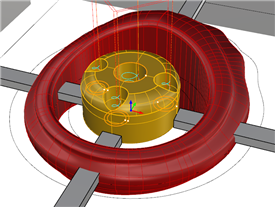 The mold is used to produce a positive wax model of a contoured ring design. The ring design is symmetrical so the opposite cavity side of the mold is identical except for the alignment pins and runner. In this example, both sides of the mold are in the same CAD file, but on different layers. Here is what the CAD file looks like along with the Machining Job Tree. 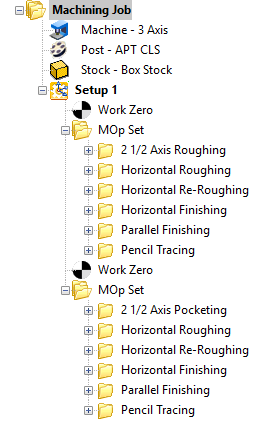 While there is only one Setup, each cavity side has its own MOp Set of toolpath operations, each preceded by a Work Zero. 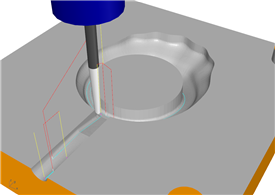 Notice that the first toolpath, 2½ Axis Roughing, is used as a finishing operation to machine the pins and clear the parting plane of material. 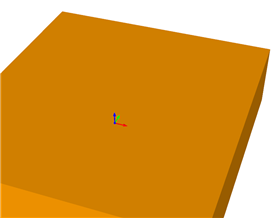 This is achieved by setting Stock to zero, the Cut Pattern to Offset and on the Cut Levels tab, checking Clear Flats and setting Bottom (B) value to -2.5 which is at the parting plane Z depth. Notice the sequence of 3 Axis finishing toolpaths using the taper mill. 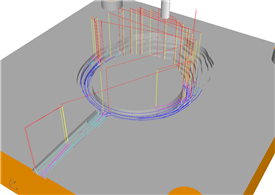 Horizontal Finishing, followed by Parallel Finishing, followed by Pencil Tracing in combination provides complete finishing of the ring contour. In this section we look at techniques of machining the master wax ring model directly from a wax stock block. 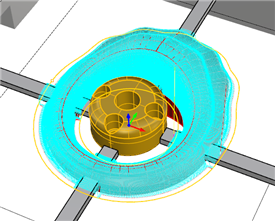 The challenge in direct machining is holding the part being machined so that all features can be machined. Special jigs or fixtures have to be employed to help in holding the part during machining. These special fixtures can be obtained from various manufacturers of CNC machines dedicated to machining for jewelry. 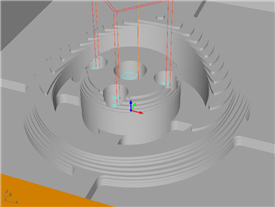 Shown below are the 2½ & 3 Axis toolpath techniques and rotary indexing operations used to machine two sides of a positive master wax model of the ring design. A rotary jig fixture is used to hold the stock material in place during machining. Note that the Professional configuration of the milling module is required for this process. Here is what the CAD file looks like along with the Machining Job Tree. 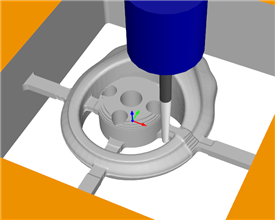 The Machine is set to 4 Axis using a Box Stock of the required dimensions to fit within the fixture. 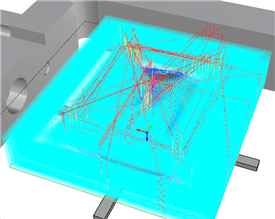 Setups 2, 3 & 4 rotate the table 180 degrees as needed to complete the 2-sided machining process. It is important to understand the position of the rotary axis defined by each setup. 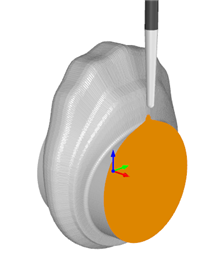 In Setup 1, the Rotary Axis is set to 0 Degrees (default). 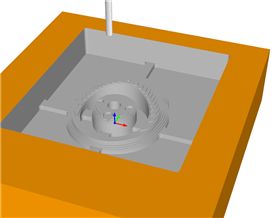 In Setup 2, the Rotary Axis is rotated by 180 Degrees. In Setup 3, the Rotary Axis is rotated back to 0 Degrees. 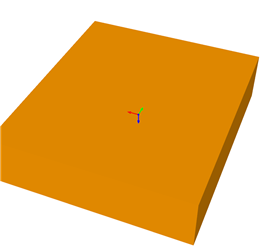 Notice the use of the planar curves as Control Geometry used to contain the cutting to only the desired areas. 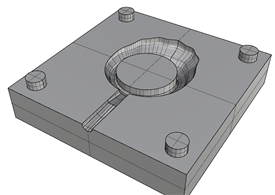 The larger rectangle contains the 3 Axis Horizontal Roughing toolpath. 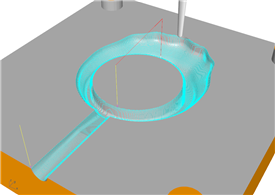 The smaller circle and offset curve contain the 3 Axis Radia Finishing toolpaths (to cut only between these two curve regions. Notice the addition of the center jig block containing 3 holes. These will serve to mount the in-process ring stock onto the 4 Axis bar extending out from the right end of the fixture. 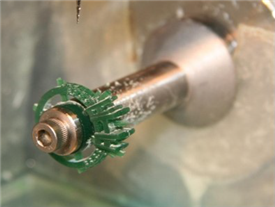 These allow the in-process part to mounted for the continuous 4th Axis Parallel Finishing toolpath. 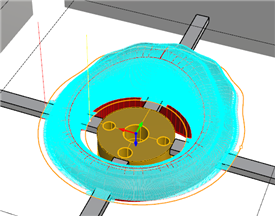 Notice that four (4) tabs were modeled that serve to anchor the part to the remaining stock during machining. 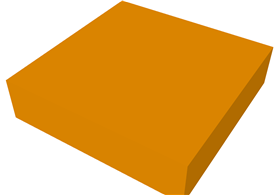 They lie on the center plane and extend from the center jig block through the part and extend past the outer containment rectangle. These form a connection bridge that keeps the part connected and stable during machining. They are removed manually after machining. Even after machining the master wax model from 2 sides using Indexed 4 Axis and Rotate Table Setups, you still may want to perform a continuous 4 Axis finishing toolpath to clean up any leftover material along the ring’s center symmetry plane. 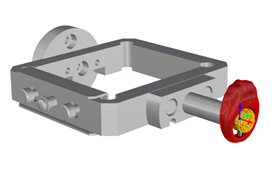 For this purpose a 4 Axis Parallel Finishing operation would be ideal. You may have noticed that a circular jig block (with holes) was left at the center of the ring. This block will server to mount the ring to the Rotary Axis extension bar located on the right side of the fixture block. 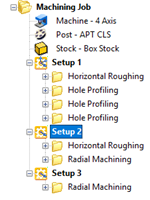 Here is what the CAD file looks like along with the Machining Job Tree. 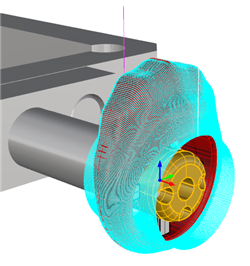 The Machine is set to 4 Axis using a Cylinder Stock of the required dimensions. Setup 1 is all that is required for the 4 Axis Parallel Finishing operation. 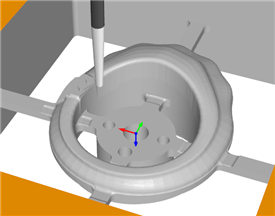 Below we see the toolpath and technique used to finish the positive master ring model in continuous 4 Axis mode. 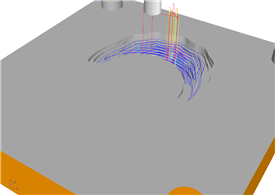 On the left, the wax ring model resulting from the Indexed 4 Axis methods and techniques shown above. 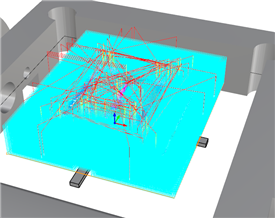 On the right we see the a cylinder stock representation. 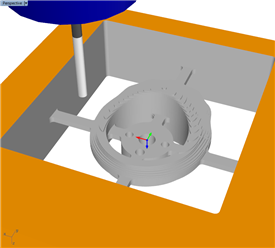 The positive wax ring model shown on the fixture below is the resulting stock remaining from the Indexed 4 Axis machining methods listed above. 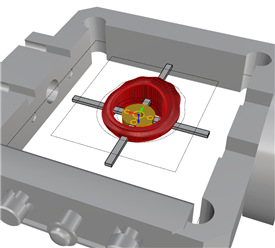 The circular jig block at the center of the positive wax ring model is mount to the Rotary Axis extension bar located on the right side of the fixture block. 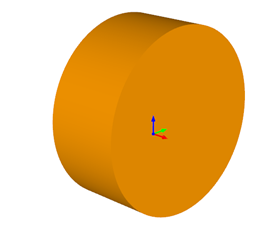 The cylinder Stock blank defined and shown below is for reference only. The 4 Axis Parallel Finishing toolpath will clean any excess wax off the ring model left over from the previous Indexed 4 Axis machining methods listed above. 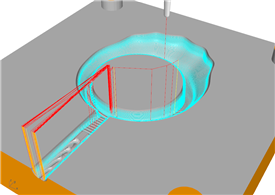 The 4 Axis Parallel Finishing toolpath is limited to a radius of 8 mm. 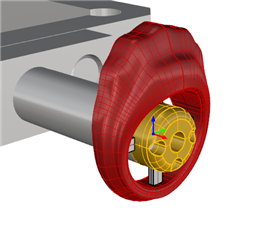 This prevents the cutter from moving below the ring’s thru hole diameter.